KELLY BRADSHAW DALTON are delighted to present for sale No.508 Collins Avenue, Whitehall, Dublin 9 to the property market. 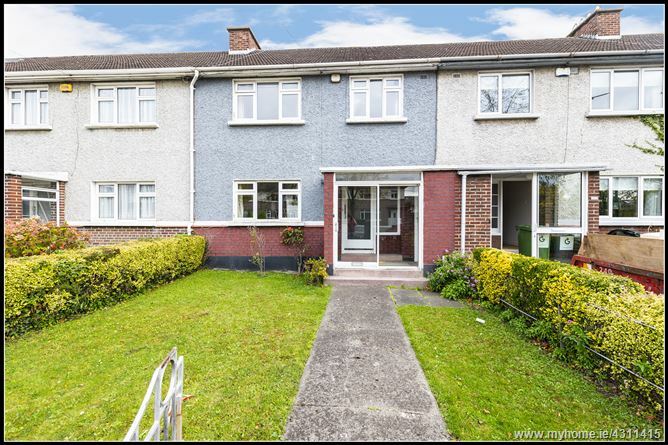 This bright spacious three bedroom terraced family home with side access is located close to Dublin City University. The property is is need of modernization throughout but this is a wonderful opportunity for those looking to upgrade to a substantial family home. Offering bright, spacious accommodation this home comprises to the front of an entrance hall and reception room with feature fireplace hardwood flooring. The kitchen and separate living/dining room is located to the rear of the house with access to the c.65 ft rear garden with a coal shed, large shed for extra storage and a toilet. This light filled room is truly the heart of this home and is sure to impress even the toughest of critics. Upstairs the landing gives way to two large double bedrooms one with feature fire place, hardwood flooring and ample storage and a third single bedroom with hardwood flooring.The landing features a sizable cupboard for extra storage.A toilet and seperate bathroom complete the accommodation. The location of this property is second to none and offers easy access to Dublin Airport, DCU, East Point Business Park, the IFSC, Beaumont Hospital and Temple Street Hospital, together with the M1 and M50 motorways. This area is also very well serviced by a very good public transport system. Several of Ireland's most prestigious educational institutions are within walking distance, namely St Patrick's College and Maryfield, all of which are associated with nearby Dublin City University. The area is also serviced by Drumcondra Station and there are also numerous convenient bus routes on your doorstep. Early viewing is highly recommended to fully appreciate the potential of 508. Kitchen overlooking rear back garden. Double Room, hardwood flooring, fireplace. Bright double room, hardwood flooring. Head north on Drumcondra Road Upper/N1, continue north on Drumcondra Road crossing the junction at Griffith Avenue and continuing north onto Swords Road, turn left onto Collins Ave Extension and No. 508 is located on your right hand side clearly marked by the Kelly Bradshaw Dalton for sale sign. Viewing details for this 3 bedroom home can be found in the On View section of MyHome.ie and Daft.ie. Please email us or phone Kelly Bradshaw Dalton on 01 8040 500 to be included on our list for viewings or to make alternative arrangements by appointment.